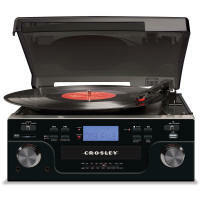 Crosley CR6008A, 'Tech Turntable' / CD Player / AM/FM Radio with USB & SD card slot. Great for transferring records to MP3 files for storage on USB enabled device such as 'Thumb / Flash Drive' or SD card. Put the needle on the record and 'rock-on' with the CR6008A 'Tech Turntable'. This streamlined, 3-Speed turntable** will allow you to transfer your vinyl directly to a USB drive or SD card or simply listen to it. The CR6008A is 'Portable Audio Ready' for easy connection to your iPod®, iPhone®, 'iGadget®, or MP3 player and features a CD player that allows recording to USB or SD and 'True Analog Tuner' AM/FM radio. Also great for connecting your existing component style, 8-Track Tape Deck, Reel to Reel Deck, Hi-Fi VCR or other audio units. Most importantly, in my opinion, features 'Line-Out' for connection to your existing stereo system. Allows conversion of records and CD's into 'MP3' format onto either USB 'Flash Drive' or SD card. Also plays your regular audio CD's or MP3 CD's containing up to approx 100 MP3 files (songs), same with USB Thumb-Drives / Flash Drives or SD cards. SD Card Slot to record your LP's or CD's via MP3 file format to a standard SD card or play existing MP3 files written to an SD card. This a great unit that does all of the above, when you don't wish to have quite the 'Antique / Vintage' look of some of the others AND if you're wanting to 'listen in quality' realize that best results will be obtained by connecting to a stereo system with larger, more capable speakers (as I allude to on many of these 'All-in-One' units, the built-in speakers are more for simply checking or 'monitoring' what's on a recorded format or when extended 'quality' is not a must). If you want a simple unit to transfer your records onto other formats combined with the ability to play / record from USB and SD, mated with the convenience of a built-in CD player and AM/FM radio, then this may likely be your ticket. Includes 12VDC / 1A, AC adaptor. Now comes with a 1 YEAR limited warranty up from their previous, 90 Day limited warranty. Dimensions: 12.75"w x 6.5"h x 12"d & ~8lbs unpacked.